...Yale students came under the Kahnian influence most forcefully through Robert Venturi, who was invited there by Paul Rudolph to expound his vision of the new design in 1962. Yale students from those years recall starving for something new amid the final drought of the New Canaan School--Philip Johnson, John Johansen, Victor Christ-Janer, and others, whose reverence for the classical Miesian discipline still lingered, even if on the wane. They were inspired by studying in Kahn's 1954 art gallery, but the arrival of Venturi signaled something entirely new. It brought the Princeton vision of Labatut and the liberating influence of Kahn as revealed through the special mannerist brilliance of Venturi's mind. C. Ray Smith, Supermannerism: New Attitudes in Post-Modern Architecture (New York: E. P. Dutton, 1977), p. 87. From what I remember, one of the Kahn buildings analyzed in McBride's article is the AFL Medical Service Plan Building 1954-56. Unfortunately, this building was demolished in 1973, and doubly unfortunate because the building was indeed unusual in terms of how we remember Kahn's work. Looking at photographs of the building now, it appears latter-day 1990s--kind of Koolhaas, kind of Herzog & de Meuron--but pure Kahn (of the 1950s) nonetheless. The AFL building is a little after Kahn's Yale Art Gallery (1950-53), but seems prescient of Kahn's Yale Center for British Art (1969-74) (across the street from the Yale Art Gallery). Maybe Kahn as anti-modern really means that Kahn was (as is often the case) ahead of his time. Kahn's AFL Medical Service Plan Building was in Philadelphia, on the south side of the 1300 block of Vine Street. on pages 79-80: Documented evidence of ties between Wright and Kahn is slight. His connection with Henry Klumb (1904-1985), a former associate of Wright's and a staunch supporter of his ideals, is noted in chapter 1. In 1952 Kahn and Wright both attended a convention of the American Institute of Architects, in 1955 (as previously noted) Kahn praised Wright's early work, and when Wright died in 1959 Kahn wrote in tribute [published in Architecture Record], "Wright gives insight to learn / that nature has no style / that nature is the greatest teacher of all / The ideas of Wright are the facets of his single thought." Scully recalls that later that same year Kahn made his first visit to a Wright building, the S.C. Johnson and Son Administration Building (1936-39), where, "to the depths of his soul, [he] was overwhelmed." It is curious in that the Scully quotation (from Scully's book Louis I. Kahn (1962)) seems to harbor a mistake, a distancing, and/or perhaps even an intentional fabrication. I, for one, find it hard to believe that Louis Kahn never visited Beth Sholom prior to late 1959, thus I doubt very much that it is true that the first Wright building Kahn visited was the S.C. Johnson building in Wisconsin. Now I have to wonder about Scully and Brownlee/DeLong (authors of Louis I. Kahn: In The Realm of Architecture). Was Scully or even Kahn(!) fabricating a false history that would distance Kahn safely away from being suspected of having ever been really influenced by Wight? And why did Brownlee/DeLong not notice and/or correct what appears to be just plain false? The only real reason I'm pointing all this out is that I believe it is much more valuable to know how designs really came about rather than how they really didn't come about. This leads me to bring up the anecdote R. shared here as to what Wright said to Venturi about Kahn, i.e., "Beware an architect with one idea." If Wright said this to Venturi circa 1955 (date of Beth Sholom construction), then the "one idea" Wright was speaking of may well be the Yale Art Gallery (1950-53). The Yale building is the first to get Kahn wide recognition, particularly for its triangulated ceiling structures, a structure, moreover, that Kahn further investigated in the second scheme of Adath Jeshurun. 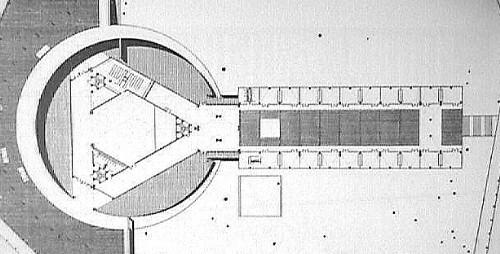 Furthermore, the second scheme of Adath Jeshurun is remarkably similar diagrammatically to the stairwell plan within the Yale Art Gallery, i.e., a triangle within a circle. Could it be that Venturi told Kahn what Wright said, and that is perhaps why Kahn wrote "The ideas of Wright are the facets of his single thought"? Louis I. Kahn, Yale Art Gallery, 1950-53 (New Haven, CN: reflected ceiling plan). 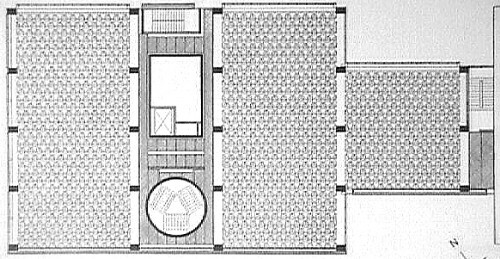 Louis I. Kahn, Adath Jeshurun Synagogue, 1954-55 (Philadelphia, PA, site plan with first floor plan, second scheme). In doing all this recent research into Kahn's architecture prior to 1950, it becomes clear that most of Kahn's clients then were Jewish and/or Jewish institutions. Besides Ahavath Israel, Adath Jeshurun, and Philadelphia Psychiatric Hospital (now Belmont Rehab, and a subsidiary of Einstein Medical Center (on North Broad Street with an historic 1902(?) synagogue on its campus, btw)), about a dozen private houses, half of which were built, all appear to be for Jewish clients. It wouldn't surprise me if much of Kahn's 'networking' back then can actually be credited to his wife, Esther Israeli Kahn, a highly educated women, and a long-standing pillar of Philadelphia's Jewish community herself. I'm mentioning all this because I believe it is indicative of how Kahn really began to achieve his greatness as an architect. Beyond the adage that "behind every great man there is a great woman," Kahn also had early exposure to great clients. So, before Kahn stepped up into the 'limelight' after the Yale Art Gallery, he was already at a nice, elevated place essentially created by Philadelphia's Jewry. In The Art Museums of Louis I. Kahn (1989), the chapter on the Yale University Art Gallery makes note of the working relationship between Kahn and Tyng relative to the building's design. Tyng's influence vis-à-vis Kahn's earlier designs which involved interlocking geometries as "structure" (especially fractal-ing triangu-larization) is exactly were Kahn and Tyng manifest a co-joining of architectural bodies and minds. The new Koolhaas/OMA Library at Seattle is very much a reenacting tribute to the coupled Kahn and Tyng. Louis I. Kahn, Yale University Art Gallery, 1951-53. Louis I Kahn and Anne Tyng, City Tower Project, 1952-57. The geometric studies of Kahn and Tyng from 1951 to 1957 may have a strong bearing on "depth" as per the initial post/query of this thread. Louis I. Kahn, Jewish Community Center (Trenton Bath House), 1954-59. Colin Rowe and Robert Slutzky, Transparency: Literal and Phenomenal, written 1955-56. Louis I. Kahn, Salk Institute for Biological Studies (Meeting House with volumetric cutouts, 1961), 1959-65. Colin Rown and Robert Slutzky, Transparency: Literal and Phenomenal. first published in Perspecta, 1963.